"Some girls like a little danger." What could be better than a babe with a bazooka? Why, an Original Dirty Pair of course! Kei and Yuri are no ordinary trouble consultants, and while they call themselves the Lovely Angels, they are better known throughout the galaxy as the Dirty Pair. Top agents for the World Welfare & Works Association, (3WA for short) they have yet to not get their man, though they have been known to cause a bit of damage in the course of their duties, but it really isn't their fault. Really. Their first assignment is to rescue the warden of a maximum security prison that has been overrun by inmates, before the marines come in to clean up the mess. As they surf into action, they meet more than they bargained for as the warden wants some payback of his own. Try to avoid being hit by shrapnel in Prison Uprising. Next, everybody's up to no good when Hallow's Eve arrives, as plots are hatching all around town to cause a little mischief during A Totally Wasted Halloween Party. The girls are on hand to keep things in order, but when the cargo their target on this mission was carrying escapes, they have little time to track down a psycho military robot before he goes postal. Our pair can't help but do a little crook cleanup along the way, can they? Ready for a little retribution? In The God's Challenge Kei and Yuri go undercover in a religious community to get the heart of a mass murder�with the man upstairs as the primary suspect. Surely they can't do more damage than the big guy, but they are sure aiming to give him a run for his money. Do not call the Lovely Angels old women, or you are sure to get a spanking. When the children of some government officials take over the site where a weapon of mass destruction is being developed, our gals are sent in to play nanny. However, the kids are having too much fun to mess with old broads, until things get a bit out of hand. This is no time to be playing with toys in But They're Only Children. Finally, a crooked gambling racket has hooked a 3WA agent in its spell, and the Dirty Pair are called in to do an intervention. Even their companion Mughi gets in on the action in Nobody's Doing It Anymore. There are some series you just know you're going to like from the trailer, and this is one of them. I had heard a lot of hype in the anime forums from ADV's icepicker over Dirty Pair, and now I know what the fuss was about. This is a fun little series, with lots of action and girls with big guns in skimpy outfits. What's not to like? Each episode is self contained, and the show is set on maximum mayhem. Behind the carnage are the feisty redheaded Kei, who gets really pissed when you start killing good looking men, and her Lumly companion Yuri, who is quite concerned about her epidermal health. Both do whatever it takes to complete their assignments, and if that means blowing a few things up and killing a bunch of people, so be it. This disc contains the first five of the ten OVAs created after the initial TV series and a couple of standalone OVAs, which ADV has recently licensed. 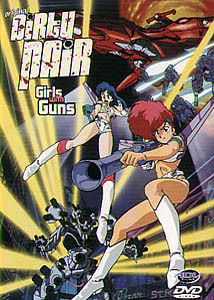 I'm gun-ho for Original Dirty Pair. Image Transfer Review: For a series which in anime terms is considered ancient, the image looks pretty good. Colors are strong, though reds tend to have the worst problems remaining consistent, black levels are pretty solid, and there is only minimal amounts of aliasing and minor compression problems. Aside from a few scratches here and there, the only real anomaly worth mentioning is a fair degree of ghosting in parts, which I assume is a source issue. Overall it looks great. Audio Transfer Review: The Japanese stereo track is solid with appropriate directionality and clean audio. Though not as aggresive as more modern mixes, it suits the program material perfectly. An English dub is also provided. Extras Review: For goodies, we get the Original Dirty Pair trailer, plus the clean opening credit animation. Trailers for ADV's upcoming Kimagure Orange Road (KOR): Summer's Beginning movie, along with Arc The Lad, Gasaraki, Gunsmith Cats,Dirty Pair Flash and Getter Robo. I should also mention that playing the disc from the menu with the English soundtrack gives you alternate title screens, where the Japanese track gives you the originals. These don't change when switching languages during play, but can be accessed using the angle button. I hope this feature becomes more available in the future for preserving the orginal Japanese animation. Don't worry baby, ADV has delivered a solid disc for the first of two Original Dirty Pair OVA DVDs. Don't let the older style animation scare you off, these episodes are action packed and these girls are ready to rock.